A Motherwell mum could be jailed after she admitted being concerned in the supply of cocaine and amphetamine. Tracy Allan was charged after a raid at her former home in Hamilton. Allan (39) and her daughter Montana Irwin (18), both of Guthrie Court, appeared at Hamilton Sheriff Court last week. Allan admitted two charges relating to a police operation in Parkholm Court, Hamilton, on November 24 last year. An allegation that she was concerned in the supply of ecstasy was dropped. Irwin walked free from the dock. She had her not guilty pleas to charges of being concerned in the supply of cocaine, amphetamine and ecstasy accepted. Irwin’s boyfriend, Joseph Findlay (20), was also accused of being concerned in the supply of ecstasy, but a jury brought in a not proven verdict after a two-day trial. Ecstasy with a potential street value of £26,000 was seized from a safe in a bedroom shared by Irwin and Findlay. The court heard Irwin wept as she told police she hadn’t a clue what was being stored in the wardrobe and was “thoroughly sickened” by the discovery. PC Gary Bone said he and colleagues went to the house armed with a search warrant and forced entry after getting no answer. There was no one at home. They had to use a hammer, a chisel and a jemmy to break into the safe. Bags of drugs, digital scales, a knife, playing cards and a mixing bowl were discovered. It was effectively a drug dealer’s kit, PC Bone told Paula Russell, prosecuting. In a statement read out to the jury, the defence conceded that Findlay’s DNA was found on a bag containing nearly half a kilo of ecstasy. Irwin denied any knowledge of the contents of the safe which she said belonged to Findlay. 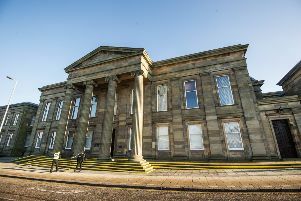 Allan and Kevin Bennett (26), of Moss Avenue, Caldercruix,who also admitted being concerned in the supply of amphetamine, are due to be sentenced December 29. Sheriff Thomas Millar continued their bail while background reports are prepared.